Insights into the natural world often come about by chance, rather than meticulous plan. I had one such fortuitous insight while conducting a long-term study of pacific chorus frogs at the University of California’s Quail Ridge Reserve. As part of my research, I would go out at night to catch and count frogs while they were breeding. The breeding season is a time of hope and fear for the frogs. Hope that they’ll find a mate, and fear that a predator will find them. Male frogs are particularly vulnerable. To attract females, they sit conspicuously at the water’s surface calling loudly. The sound of their calls not only fills the air, but also vibrates the water. . . providing plenty of signals for predators to home in on. 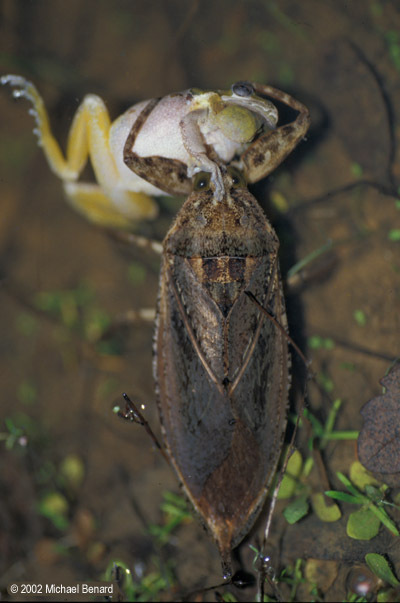 I saw a graphic example of these predators on one of my first visits to the ponds at Quail Ridge: a giant water bug (Belostomatidae: Lethocerus americanus) eating a male frog. The prey of these enormous insects are captured with raptorial forelimbs, killed by an injection of venom, and injested in partially-digested liquid form through sucking mouthparts. I was amazed to see this fascinating reversal of the classic “frog eats bug” story. At first I thought this might be a rare or unusual observation, but as I frequented the ponds over the rest of the year, I saw more bugs consuming frogs. It soon became clear that these bugs were a serious threat to the frogs. The frequency of these attacks and the conspicuous behavior of the male frogs made me wonder if the water bugs might be picking out specific individual frogs to eat. It is well known that many female frogs pick their mates based on song quality, fighting ability, size or some other metric. Could the giant water bugs also be preying upon a non-random set of frogs? To answer this question I compared the size of frogs captured by the water bugs to the size of those not captured by the bugs. I made a similar size comparison between males that were mated to the female and unmated males. Both the males captured by the water bugs and the males that successfully mated were substantially larger than the average males. This suggests that sexual selection in which larger males are favored through increased mating success, is in direct conflict with natural selection, in which smaller males are favored because they are less likely to be killed by a water bug. Benard 2007. Predators and Mates: Conflicting Selection on the Size of Male Pacific Treefrogs (Pseudacris regilla). Journal of Herpetology. 41:317-320. . . . or just drop me an email and I will send you a pdf. This entry was posted in Natural History, Science and tagged California, Frog, giant water bug, Invertebrate, Mating, pacific chorus frog, Predation, Science. Bookmark the permalink.